The classiest and most elegant alternative to eating spoonfuls of Nutella straight from the jar. 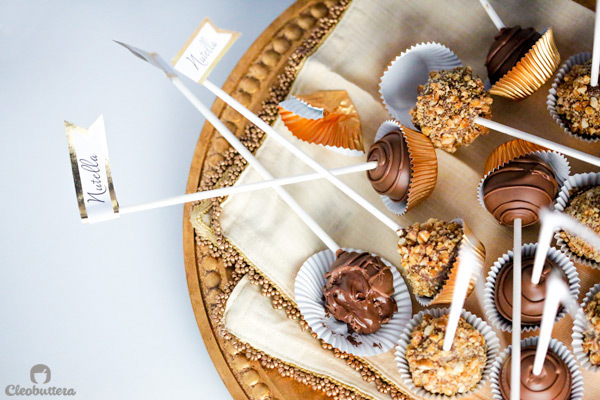 Scoops of Nutella popped on sticks, dipped in chocolate and sprinkled with hazelnut praline are a fancy way to serve up Nutella on special occasions. Let’s pretend I’m all calm and keeping it all together here and not at all freaking over the fact that I’m actually typing words that anyone with internet access could read and posting photos that I took of my food for anyone to see. Or that I just wrote a run-on sentence. My fingers are not shivering over the keyboard or anything. I’m cool. So…Hey there! I’m your new food blogger on the web. An Egyptian baking enthusiast who has a lot to say about food and that’s why I’m here! Food is my favorite topic and I can’t wait to pour it all out on the blog. Trigger my food talk button and good luck trying to make me stop! You could hop over to the About Me page to learn more about the obsession. But for now could we talk about these Molten Nutella Pops? Because admit it…we’ve all done it before. And by before, I mean more times than we could count. Sneaking in that spoon into that jar of Nutella, while talking yourself into thinking that you’ll stop after just this one. You make mental excuses to give in to just one more spoonful, and make a promise to yourself that that will indeed be your last…Yeah right! Then you convince yourself that the insides of the jar needs a little cleaning up via your spoon. Good luck with that! And before you know it…your “tidying up” of its interior had resulted into a half empty jar. Or half full, depending on how you look at it. Stress, headaches, pregnancy cravings, exams…you name it, all got the blame. Make excuses all you want, but we all know very well that its just the addictive deliciousness of Nutella that is to blame. If you’ve never experienced such an incident, first of all: seriously?! But then hats off to you my friend, and my advise to you would be to stay away…stay away from that jar; you don’t want to inflict addiction upon yourself. So these pops are simply just that! An ode to those times when only spoonfuls of Nutella straight from the jar can do it. Pure unadeltrated Nutella camouflaged under a cute wrapping, to look like you’re eating an elegant dessert instead of the usual inhale-off-the-spoon habit. They are just more socially acceptable this way. 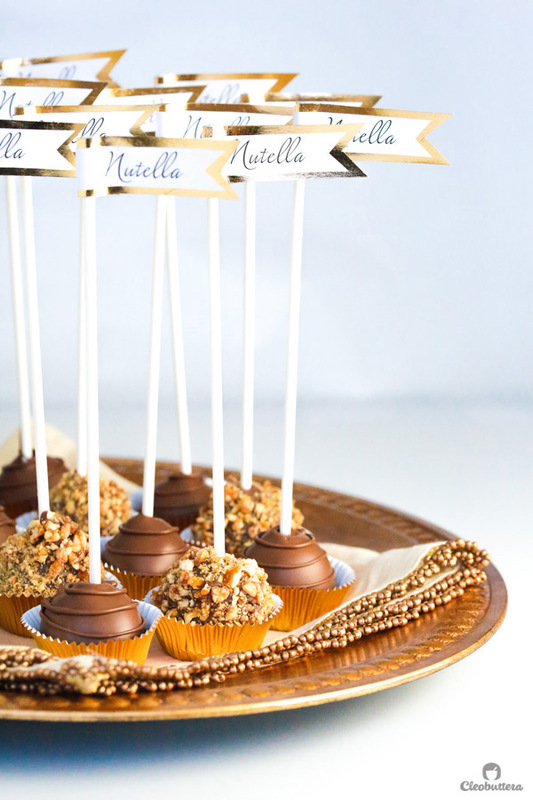 Scoops of Nutella are popped on lollipop sticks and dipped in chocolate just to keep them from oozing all over. For texture lovers, a sprinkle of homemade hazelnut praline can be added for a pleasant crunch, that contrasts beautifully with the creaminess of the Nutella and chocolate shell. But hey, you could sprinkle them with anything you want like toasted nuts of your choice or even sprinkles. You’re the boss of your own pops! 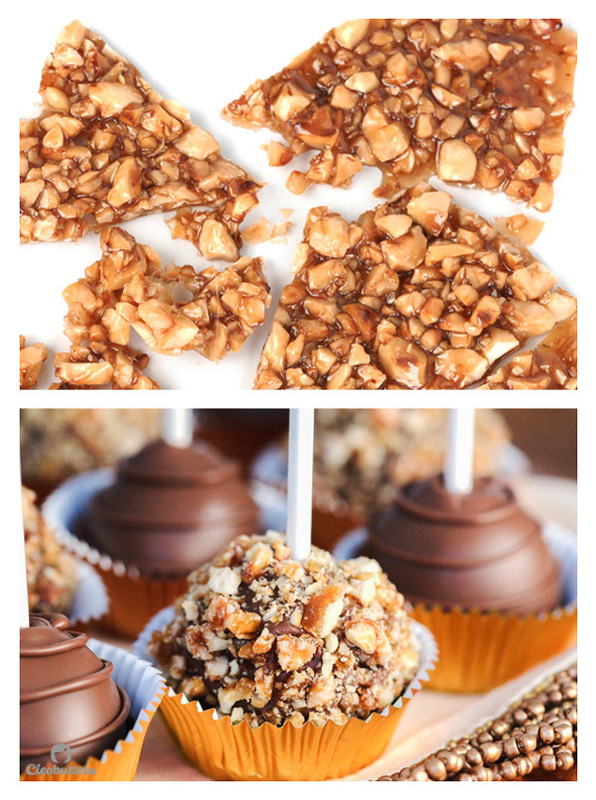 These pops require only 2 ingredients to make, 4 if you’re adding the hazelnut crunch. First you’ll begin by scooping out rounded spoonfuls of chilled Nutella onto a baking sheet and freeze until solid. 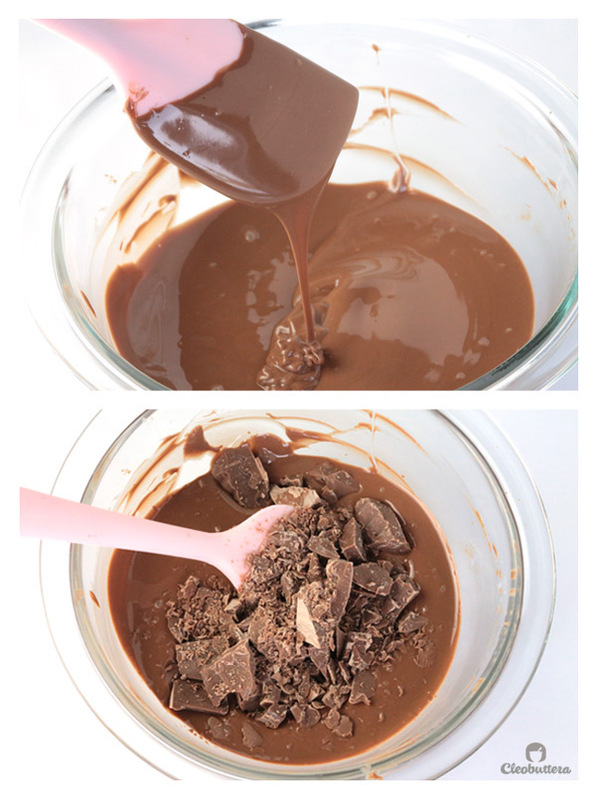 Then you’ll melt some chocolate, then add more chopped chocolate to it and stir together until evenly melted. This is just a quick way of getting the chocolate to the right temperature ideal for covering, aka tempering. 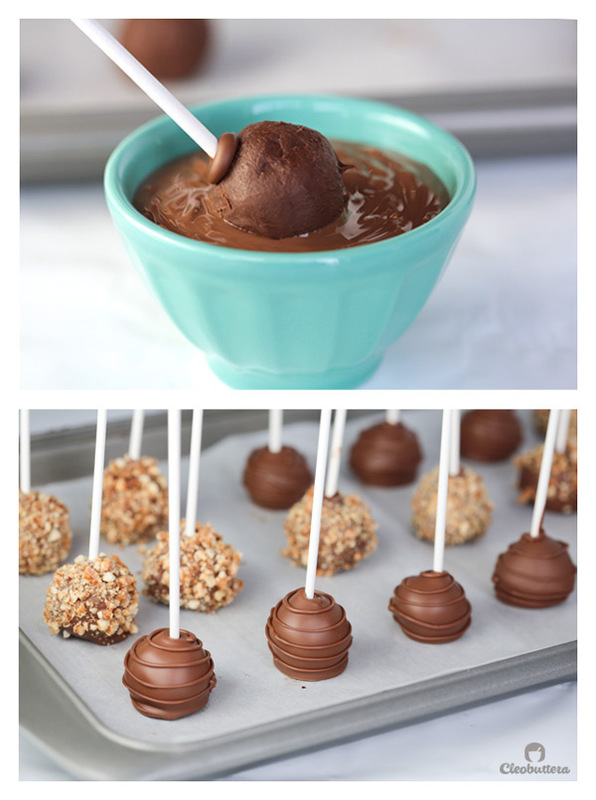 Now get those lollipop sticks and dip them into the chocolate, then into the frozen Nutella balls. This helps them stick better to the sticks. You could refreeze them again at this point, if you feel that the Nutella is softening up. 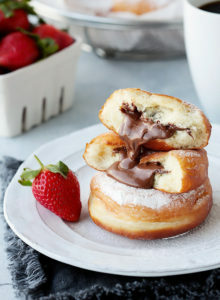 Holding them from the sticks, give the Nutella balls a good dive into the melted chocolate and lightly shake off any access. Place them on the baking sheet and chill in the fridge until the chocolate sets. You could then drizzle or pipe decorations on them using the remaining melted chocolate. For the ones with that golden crunch, you could make some easy hazelnut praline, crush it up then press it onto the pops shortly after they’ve been dipped into the chocolate. To jazz them up, tuck them in mini cupcake liners and if you wish you could add labels that say ‘Nutella’ so people know what’s inside. 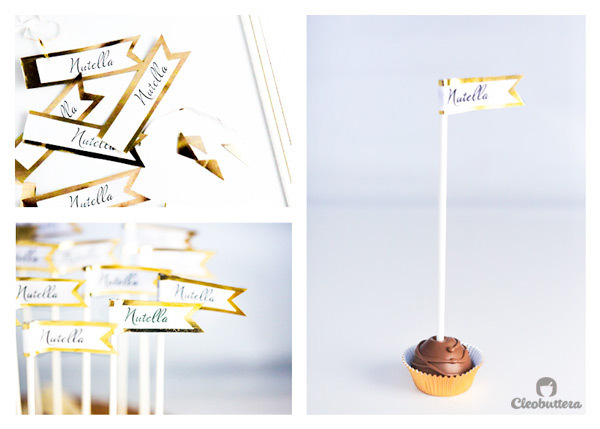 You can download the ones I used here (Nutella Labels), and I’ve included 2 different fonts to choose from. I glued mine on a gold wrapping paper that I had but any kind of paper will work. So there you have it…one of the world’s most beloved flavors turned into an elegant, portable dessert that is guaranteed to impress at any occasion. 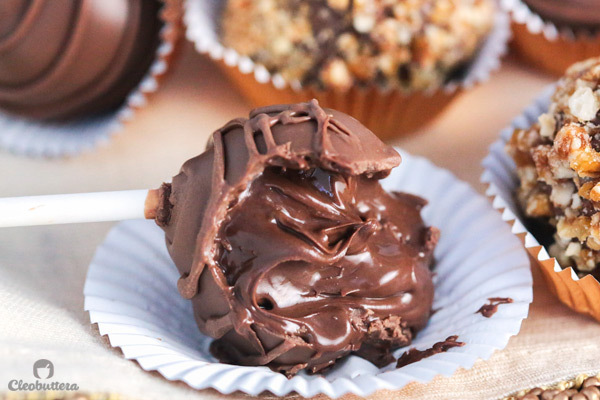 Nutella lovers will flip over these! Turns out that writing about chocolate and having chocolate in the mouth, infinitely eases the anxiety. 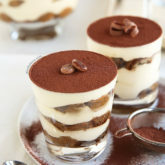 Prepare hazelnut praline (recipe below), if using (recipe below) up to 2 days in advance, and set aside until ready to use. Chill a jar of Nutella in the fridge for at least 2 hours or overnight. 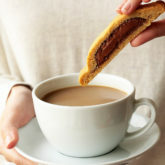 Chilling is key, so that the Nutella maintains a round shape and doesn't spread out when scooped. Line a baking sheet with parchment paper or silicone mat. This will make the frozen Nutella balls peel easily from the baking sheet. Using a tablespoon size ice cream scoop or a melon baller, scoop out 15 rounded tablespoons of Nutella onto the prepared baking sheet. Freeze until solid, at least one hour or overnight. For a perfectly round shape, you might want to lightly roll the balls between cold hands after about 30 minutes of freezing. Keeping the Nutella balls in the freezer, microwave 6 ounces of the chocolate, stirring every 30 seconds until about two-thirds melted, about 1 to 2 minutes. 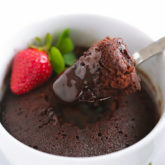 Remove from microwave and add remaining 2 ounces of chocolate, and stir until melted. If necessary, zap it back in the microwave for no more than 5 seconds to complete the melting. 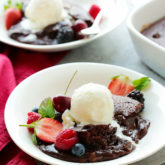 Transfer melted chocolate in a deep bowl or large cup. 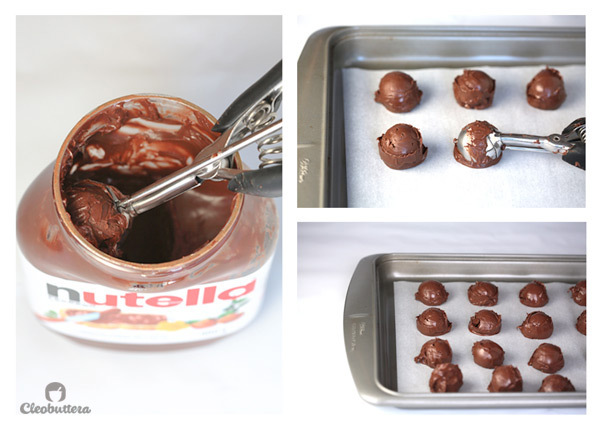 Take the Nutella balls out of the freezer. 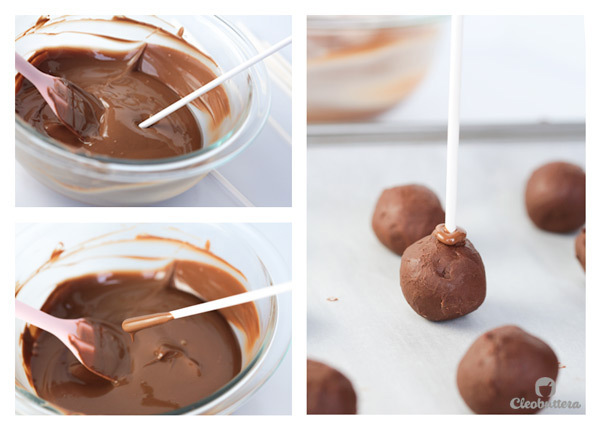 Dip about 1/2 an inch of each lollipop stick in the melted chocolate, then insert it upright into the Nutella balls. Repeat with all the rest. If the Nutella balls start to soften up, return back to the freezer for a few minutes until firm again. 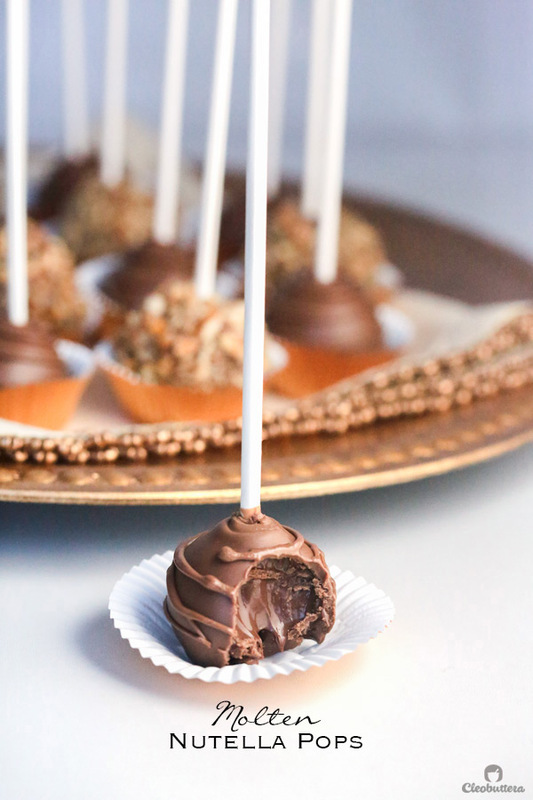 Holding by the stick, start dipping the balls in the melted chocolate, one at a time. At this point, you could start pressing on the crushed hazelnut praline, if using, before the chocolate starts to harden up. Place the pops on the lined baking sheet, with the balls facing down. Let cool at room temperature or in the fridge until the chocolate shell sets. If desired, transfer any remaining melted chocolate to a piping bag or zipper lock bag and snip its end with scissors to start decorating. Add swirls, drizzles or any design of your choice. Alternatively, a fork can be used to create more random but equally pretty drizzles. Let the decorations set, then place in mini cupcake liners to serve. Enjoy immediately or store in the fridge, covered, for a week. For the molten effect, let the pops come to room temperature before serving. The pops also taste great cold straight from the fridge; they won't ooze out though. 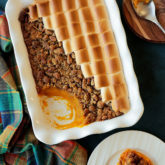 Line a baking sheet with a silicon mat or generously buttered foil. Keep nearby. Place the sugar and water into a saucepan over medium high heat, swirling the pan until sugar is dissolved. Boil rapidly until the syrup turns a rich golden brown. Remove the saucepan from the heat and stir in the hazelnuts. Pour over the prepared baking sheet. 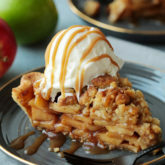 Let cool completely until it firms up into a brittle like caramel. Place the praline in a zipper lock bag and seal. Using a meat tenderiser, hammer or rolling pin, crush the praline into small pieces but not powder. Set aside until ready to use. 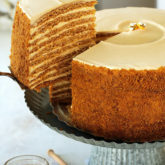 This recipe makes 15 pops but you could make as little or many as you need, by cutting the recipe or doubling or more. I used milk chocolate for dipping because I find it marries perfectly with the milk chocolatey flavor of Nutella, but you could use the chocolate of your preference. 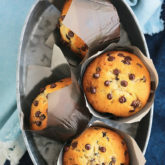 Dark, semi-sweet or white chocolate and candy melts will all work, but I don't recommend using chocolate chips because they are too thick for dipping. Congrats!!! Good Luck CleoB 🙂 and I guess good bye hot dinners! Wow wow wow!!! Amazing start:) can’t wait for more:) this post just made me drool for nutella!! Super work…. Having second thoughts about my diet. Wish you the best of luck CleoB. And finally your dream came true Bito!!! So happy for you honey & wishing you the best of luck Insha Allah. Thank you Sasso for always believing in me. Without your encouragement, and props, I wouldn’t have started anything. Just finished reading it and loooove it! I know!! About time, right?! You’re constant encouragement and nagging to start actually helped this to finally happen. This says a lot coming from a non-chocolate person…how could you btw?! Woooooohoooooo! Took your advise and finally walked the walk! Great job dear. And verrrry interesting. Cant wait for the next topic. Woooohoooooo… Best desserts in town.. Hands down.. And finally OUR dream came true!! Hahahaha 😉 msA darling.. Love it.. I had the exact same feeling when I read your blog! You have to admit that foodies are the best! CONGRATULATIONS Tasbih! YOU ARE ONE OF THE MOST TALENTED PEOPLE I KNOW! I am so lucky to know you! Wishing you the very best my fabulous friend! Looking forward to seeing your amazing creations! You rock! Daniela your comments are so flattering as always. You’re photography tips have been so helpful. I still have a long way to go though. I really really miss you and your family and I hope we always stay in touch. Best of luck and so much love to all of you. Yummy yummy, Bito, you really made my day….. I’m sooo very much proud that I am your Dad. You prove to me & to everyone who know you that you are a gifted artist baker. Actually to those who don’t know you well, Bito is a multi-talented artist. She painted so many beautiful paintings, she also made some unbelievably fantastic sculptures, but she ended up mixing all the talents that she is given by Almighty GOD, in this amazing most beautiful blog as CleoButtera. Bito, I loved every photo like you wouldn’t believe, the recipe is so clear& you made it sound very easy for someone like me to go right now, get a Nutella jar& start liking my fingers until I am done with it. But on a second thought I decided to wait for my beloved daughter to send me a sampler. Can’t wait for your next recipe. Luv U, may GOD bless you & all of you beautiful family. Thank you Abby for making my little girl’s dream come true. Dady as usual you leave me speechless with your sweetest comments that are so full of love. If I do have any cell of talent in me then its because I’ve inherited from you and Mom. And if I ever make anything that makes you proud then its because I’m your daughter. Your love, support and endless prayers are what makes me and my brothers worthy of anything. You and Mom are the light of my life…keep shining on me. Oh my GOD today, I am the happiest Mom on earth, my little girl Bito became an international blogger, my perfectionist gifted daugher is giving the whole world a glimpse of what I have been seeing with my own eyes since you were born. We always expected a great success for a great gifted kid. Now I am seeing it happening in front of the whole world. The recipe is very clear sounds easy to cook, the photos are amazing & the taste is definitely delicious. “” I am your mother I know “” luv, hugs& kisses. GOD bless. Thank you Bito for mentioning my name in your introduction & many thanks to Boody for helping my sweet Bito realise her dream. Mommy if I could name the blog MOM, I’d do it! I consider myself to be the luckiest girl alive for having the most amazing mom in the world! The most beautiful thing in me is being your daughter. Without your encouragement ever since I was a little girl, I would never have discovered what I love to do the most. Thank you for supplying me with all the cookbooks, baking equipment and ingredients that I could ever need. Most of all thank you for taking the mess I used to make in the kitchen with a grain of salt. Also thank you for all the art classes you took me to. Your support is what means the most and what I need the most. You are my hero! I wish I could be to my kids half the mother you are to me, because that’s still pretty plenty! Dondon I’m still paying the price for inhaling that box of donuts with you! We are such bad influence on each other when it comes to food. Craving a couple of these nutella pops to devour right now! They looks so good! Thanks for stopping by Thalia!! You’re actually the first to comment here who’s not family or friends. I’m so happy you found the blog because that made me discover yours, which is…swoooooon…over-the-top-amazing! Will definitely be following you. As for these pops, I think they might just taste even better than they look:) Thanks for your comment. My little Sister has finally launched her blog!!!!! I’m simply impressed as usual !!!!! Can’t wait to devour one of those Nutella pops, begad 7aram! Menna you can’t imagine what your comments mean to me! They are extra special coming from such an amazing artist like yourself! I’m always blown away by your mandala and if you like anything I make, then that’s HUUUUUUGE! Thank you for all the love. 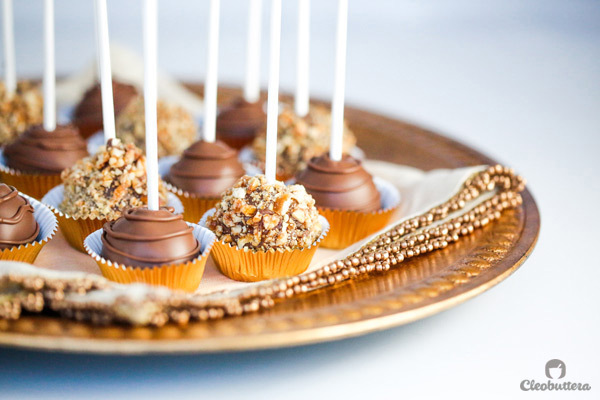 These pops look delicious – I especially like the one wrapped in nuts. I am a big Nutella fan, so this is a MUST try for me! Pinned! 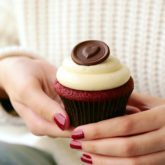 Sarah thanks for stopping by and for your sweet comment:) U really can’t go wrong whenever Nutella is involved right? Thanks so much for the pin. I just checked out your blog…its amazing! Will definitely follow along. These look ALMOST too perfect to eat! I love how did the design of the chocolate and pairing it with the gold foil is just beautiful! Nada that is so sweet of you! I’m really so flattered; I don’t know what to say. Hope you enjoy the rest of the recipes and attempt some of them. 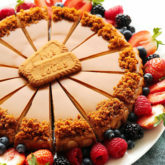 And finally… We’ll have acess to the most amazing desserts and reciepes in the world! Keep shining CleoB, the best is yet to come! Dodo you’ve just set the expectations so high and I don’t know if I could ever meet them:) That’s really so nice of you to say. I’m so happy you’ll be following along all the way from the UK. Jannah you’re such a sweet girl and you always have something nice for me to say. You are really beyond talented and I’m so proud of you for bring so eager to learn more and further explore the baking world. I hope I could be of some inspiration to you, even if just one tiny bit. 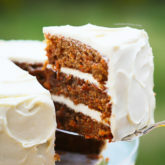 I know for sure than you’ve amazed me with you’re super awesome cakes! I can’t wait to see more of your creations. i am really glad to read you from the very first blog. I don”t know you but I will keep following more and more of your posts. Don’t let your fans wait too much 🙂 wishing you the best of luck dear. I just like the helpful info you provide on your articles. I’ll bookmark your blog and check once more here frequently. I am relatively certain I will learn many new stuff proper right here! Good luck for the following! Hi Luciano! I’m terribly sorry, I just found that your comment got caught in spam. I usually answer back comments as soon as I can, but I just saw yours now among others. Thank you so much for your thoughtful comment and your support from my very first post. Yes please stop by again, there’s so much more to come. Hi! Congratulations on your new blog! It looks amazing! You totally captured how it feels to write your first post. Reading the first few paragraphs of your post brought back some sweet memories. Thanks for reminding me of that. Hi! I just discovered your blog on Buzzfeed and I am already obsessed with it! These pops look absolutely amazing, I just know I’ll be making them the next chance I get! Congrats on the blog and best of luck! Thank you Andrea! I also owe a BIG thanks to Buzzfeed for bringing you and many others to my blog. 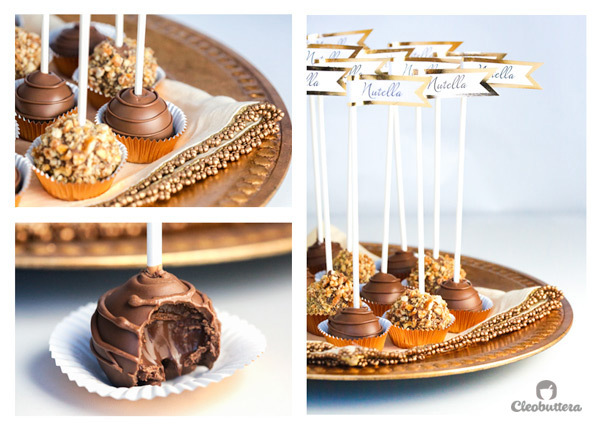 What a pleasure to have you all visit here so I could share with you my love for baking…and eating:) I’m sure the Nutella Pops will be a hit if you make them. Nutella lovers are always so impressed by them. Wait, you JUST started blogging?! Girl, you’re unreal! Your photography skills are on point. Cannot wait to see what you come up with. My baby blog will be a month old in 2 days:) That’s really so kind of you Sarah. Thank you so much for your encouraging words. Any tips on how to maintain your sanity the first few months of blogging? My biggest piece of advice is to keep producing quality content, which you are! You’ve already got a head start on many newbie bloggers with a clean layout, great photography, and a awesome recipes. Just keep it up! Oh, and don’t eat too many sweets. Give em to the neighbors. Cleobuttera doesn’t need a sugar crash. 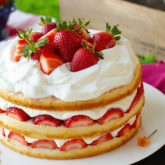 This is absolutely beautiful and mouthwatering!!!! I’ve got to try it. Congrats on your beautiful blog! 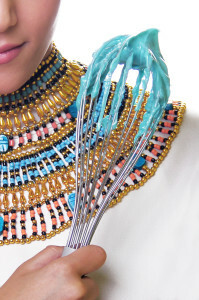 In your profile picture, you have some blue stuff on the whisk. Can you please tell me what that is..It looks very tempting. Thank you so much June! But I have to admit that they’re quiet dangerous to have around. Absolutely Awesome and mouthwatering!!!! I’ve got to try it. Oh I love the cake pop mold trick! What an idea?! I have to consider them the next time I make them:) Thanks Yasmin for your feedback. OK so my family is crazy about your blog .. And my husband is begging me to do one of your – and I quote him – tummy satisfying – desserts. So I decided to pop those beauties . one question though, I can’t find those lollis anywhere ! 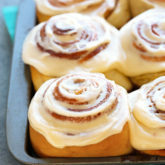 Can u please tell me where can I find them in Cairo? I’ll try those today and keep you posted. Hahaaaa love that “tummy satisfying” description😄 And those Nutella pops are sure to satisfy any chocolate craving tummy! Please give my best regards to your sweet family. You could find the lollipop sticks at Tulip. 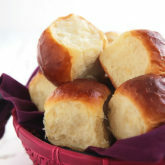 I chanced upon your blog while browsing through Sally’s Baking Addiction! Brilliantly done! I was giggling the entire time as I actually had a jar of Nutella in hand and was promptly “tidying” up the sides! 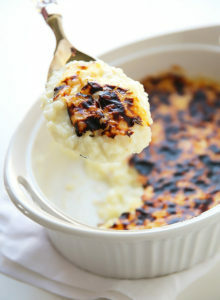 It’s fate I do declare that I found your blog and this diet ruining, sun shining, clouds floating, birds singing recipe!!!! P.S – the photography is amazing! Kudos to you.